VINTAGE COSTUME ANTIQUE ESTATE JEWELRY BROOCHES AND PINS! Art Deco Pastel Marquise Glass Stone Silvertone Vintage Antique Estate Brooch Pin For Weddings, Proms, Pageants And Parties! 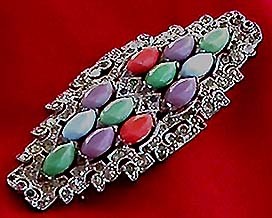 Item #P168185 - Art Deco Pastel Marquise Glass Stone Silvertone Vintage Antique Estate Brooch Pin. Size: Width: 3" x Length: 1 1/8". Beautiful streamlined, geometrical Art Deco bar pin, encrusted with glitzy clear rhinestones and occasional green, blue, purple rhinestones, then further embellished by faceted marquise cut glass stones of sky blue, apple green, orange and soft purple pastel colors. Excellent condition. A fabulous brooch pin to wear at weddings, prom nights, pageants, parties, cruises and special functions! Price US$128.00.